This item is generally in stock and ships in 1-2 days. Looking to upgrade your factory turbo but on a budget? This high quality factory Garrett assembled turbo is a great choice for builds in the 250-400hp range. The 50 trim Garrett is still one of the most popular out there today and with a name like Garrett you know you buying a quality piece that is built to last. 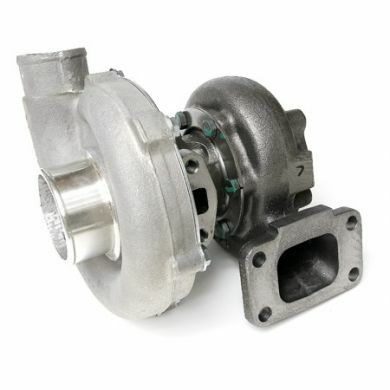 Economically priced, these turbo's are a great way to get in the door to a T3/T4 for your 2.3 Ford. This turbo comes standard with a heavy duty 360* thrust bearing (compared to most competitor's cheaper 270* bearing) and a T04E compressor housing with 3" inlet and 2" outlet. The turbine wheel has been upgraded as well to a high flow stage 3 wheel which works great on the street. T3 turbine housing available with factory 5 bolt discharge will allow your stock outlet elbow to bolt right on. Oil cooled, and accepts all factory 2.3 oil feed and drain lines. Full Garrett warranty included, select from the available options below. If you need help deciding which A/R to choose for your combination, feel free to contact us for a recommendation.